Yesterday's election was the country's third in just under six years. Add to that the leadership churn, with three sitting prime ministers toppled in just over six years, and it comes to a lot of change. Given the uncertainty now surrounding yesterday's ballot, the weakening of Prime Minister Turnbull's position within his own party, and the likelihood that we will have either a minority government or a government with a wafer-thin majority, the sense of uncertainty will be reinforced. The most important issue of this coming election is that, whoever wins, it should be the fixed decision point for Australia's prime minister throughout the life of the next parliament. The intra-party ‘spills’ of the past six years have become a dangerous norm, hurtful at home but also damaging to Canberra's credibility overseas. Contested politics is part of the democratic overhead. Western democracies are under general strain. But Australia's election cycle is among the shortest. The joke that Australia is the Pacific's least stable democracy will stick if it happens again. Foreign policy continuity can still be maintained between officials, even ministers. But if Australia can't wait to change leaders in between elections, it becomes harder to sell stability where it is so desperately needed, in the near region. The merry go round of prime ministers not only presents a family photo problem at the end of summits — who will show up? — but also a big picture problem. What is the Australian narrative? What is the long-term national strategy? Where does the country place itself in the region and the world? No recent prime minister has been around long enough to convincingly outline that vision, let alone see it through. It’s a far cry from the certainty of the Howard years, when the prime minister was in place for more than a decade, as were his foreign minister and treasurer. Over the course of the eight-week election campaign, the Lowy Institute hosted Greens leader Richard di Natale, Labor Deputy Leader and Shadow Foreign Minister Tanya Plibersek, and Liberal Deputy Leader and Foreign Minister Julie Bishop. Di Natale spoke first and foreign policy featured in his address. He declared it was time to review the Australian-US alliance and argued the 'unquestioning consensus' that spans the two major parties on most areas of foreign policy and defence 'does not serve us well'. As John Gooding wrote the next day, Di Natale sparked a wealth of (in some cases fierce) responses from the Australian commentariat. Di Natale’s extremist speech to the Lowy Institute yesterday makes a bad joke of Kroger’s earlier justification for his tawdry preferences proposal: that under their new leader the Greens were not as extreme or marginal as previously. Malcolm Jorgensen also responded to Di Natale, noting 'foreign policy requires more than strong moral convictions'. Much media attention has focused on Di Natale's disparagement of the US-Australia alliance for drawing Australia into the 'horrific consequences' of US foreign policy. The Senator is surely correct that the alliance has drawn Australia into fraught foreign policy situations, not least of which was the ill-conceived and catastrophic 2003 Iraq War. Conversely, the alliance has also underwritten the better part of a century of regional stability, with benefits that are both less conspicuous but more consequential. It is in the preservation of regional stability that the limitations of a Greens foreign policy are most clearly demonstrated. Georgina Downer argued the Di Natale speech was a reminder of the 'gaps that exist between the political parties'. The Coalition construes the national interest in a pragmatic, realist way. It focuses on securing Australia’s prosperity, through trade liberalisation, protecting our borders and trade routes, and maintaining a stable and peaceful Asian and Pacific neighbourhood. To achieve the best outcome for Australia, the Coalition will use whatever tools are available, be they bilateral, multilateral or both. For Labor, the national interest means being a good international citizen. Labor is ideologically committed to multilateralism and finding solutions through international organisations such as the United Nations, and is sceptical of bilateral and unilateral agendas. ...it’s easy to overstate the differences in foreign policy between the major parties. Most politicians take a national view, working together to promote the national interest across party lines. The differences are real but at the margins, something the Shadow Foreign Minister Tanya Plibersek emphasised in her address at the Lowy Institute on Tuesday. Plibersek would be a 21st century, conventional foreign minister, with little to distinguish her diplomatic priorities from those of the incumbent, Julie Bishop. Julie Bishop, a keen and popular campaigner, mostly wore her Deputy Party Leader hat as she criss-crossed the country to bolster support for the LNP Coalition. Her address to the Lowy Institute focused largely on the Turnbull Government's economic diplomacy agenda but she strayed from that script in the Q&A to reveal her proudest achievements, responded to news stories about the next DFAT secretary, and put a strong case for Britain to remain in the EU. In a review of Bishop's record as foreign minister, Kitney described her as a 'competent, conscientious and cautious' minister. Bishop gets high marks for her work in the Abbott government’s response to the shooting down of Malaysian Airlines flight MH 17, especially her diplomatic lobbying to bring about a unanimous vote in the UN for the establishment of an international tribunal to investigate the bringing down of the plane. Her visit to Tehran last year and the opening of a dialogue with Iran were also seen as important foreign policy breakthroughs. More mixed are reviews of Bishop’s work on Australia’s critical relationships with Indonesia and China. As the campaign weeks went by, it was clear both sides of politics were happy to focus on domestic issues. Our commentators would have liked a bit more. Lowy Institute nonresident fellow Mike Callaghan drew attention to the fact 2016 is a US presidential election year, and this time it comes with significant economic risks for Australia. Given the warning by Treasury in the Pre-election Economic and Fiscal Outlook, surely this should be discussed, Callaghan argued. The concern is that the economic debate in the Australian election is based on the premise that we will continue to face a benign international economic environment that will provide us the luxury to very gradually strengthen our fiscal position at some time in the future. But as John Lennon said ‘life is what happens to you while you’re busy making other plans’. If ‘life’ includes the election of President Trump, or President Sanders, Australia has little policy flexibility to deal with the economic shocks that could eventuate. The last week of the campaign was dominated by Brexit. In the run up to Britain’s historic referendum, the Turnbull government made it clear it hoped the UK would vote to remain. In her speech at the Lowy Insitute, Julie Bishop noted the deep ties between Australia and the UK and observed that having 'a like-minded partner within the European Union is clearly in Australia's interests'. But it was not to be. The Leave campaign won the day and suddenly many of the things we thought we knew, about the UK, about the EU’s stability, and about the limited appeal of extremist parties, no longer looked very familiar at all. 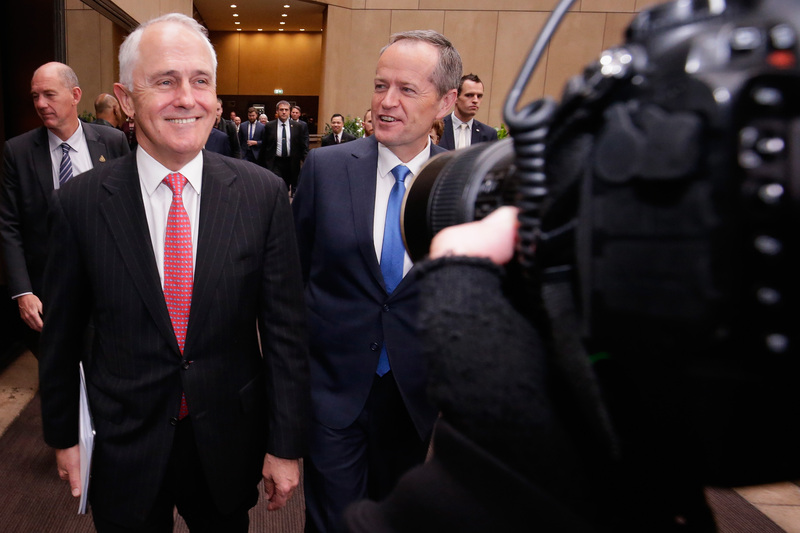 Sam Roggeveen analysed Turnbull’s response in the context of how, assuming a Coalition victory, a new Turnbull government would approach immigration and globalisation. Post-Brexit, the PM asked voters to back his party in order to ensure economic stability in a 'global economy over which we have no control.' The use of 'control' here is rather telling, as 'taking back control' was the central theme of the Leave campaign, appealing to a segment of the British population that considered itself disempowered. Turnbull was essentially arguing that there is no alternative to our loss of control, and that turning our back on globalisation in order to reassert control would ultimately be self-defeating. He's right, but whether voters are prepared to accept this is an open question. Both will need to acknowledge the fundamental changes in our region and the need for Australia to reshape our national psyche, which must be focused much more on Asia than on our well-established links with the US, the UK and Europe. In our final post of the election campaign, Geoff Kitney — who predicted Turnbull would get back with a reduced majority — debated which Turnbull voters would get. Would it be the progressive Turnbull we thought he knew before he ousted Tony Abbott to take over as PM last year? Would it be the Turnbull who then had to shift to the right to make peace with the more conservative elements in the LNP coalition? Or will it be a different version again? Either way, the next parliament will be one where foreign affairs and defence will come into sharp focus, Kitney wrote. The reality of Australian politics is that the parliament can be relied upon to give its support to the government of the day on defence, strategic and security matters. What will potentially be of much greater interest during the term of the 45th Australian Parliament will be how Australia's place in the world is affected by external events and how the new government responds to them.